BOTOX injections are the most popular cosmetic procedure in America used to reduce the appearance of facial wrinkles. Made from a purified protein, BOTOX relaxes wrinkles and gives the face a rejuvenated look. BOTOX has outstanding efficacy and a very high safety profile. It is injected under the skin into areas surrounding the upper face and eyes, forehead and mouth to smooth crow’s feet, frown and worry lines and lines on the neck. BOTOX is also used effectively for treatment of increased sweating of the palms, soles and underarms. BOTOX requires no downtime except for a small possibility of bruising. Results generally last an average of 3 months. Juvederm injectable gels gently smooth wrinkles and folds around the mouth and nose and restore youthful volume to the face. Made with hyaluronic acid, a natural substance found in the body that works with collagen and elastin to provide volume and support to the skin, Juvederm is especially effective on smile lines and nasolabial folds that run from the bottom of the nose to the sides of the mouth. Treatment takes only 30 minutes with immediate results. Some bruising may appear post procedure, but for the most part downtime is minimal and results typically last about 3-6 months. 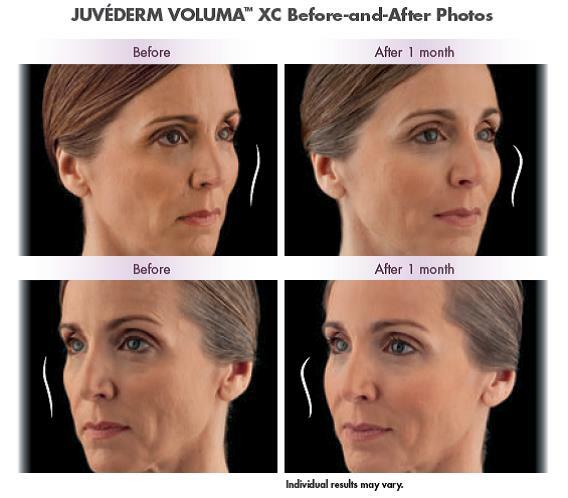 Juvederm Voluma XC is the only FDA-approved dermal filler to instantly add volume to the cheek in the mid-face. Voluma contains a modified hyaluronic acid that gives a subtle lift and helps restore contour for up to 2 years. 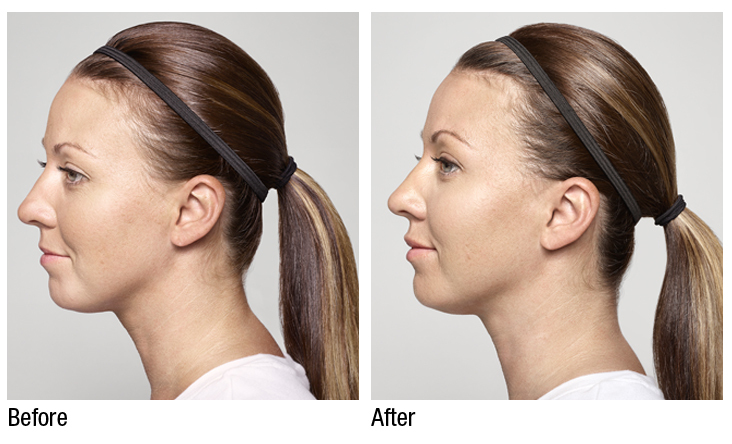 Voluma enhances contour and creates a more youthful profile. Restylane is a dermal filler designed to smooth wrinkles, sculpt lips and shape facial contours. It is a clear, synthetic gel made with hyaluronic acid, a substance that occurs naturally in our skin to help provide fullness and elasticity. However, as we age, the amount of hyaluronic acid in our skin diminishes, resulting in loss of volume and increased chances for wrinkles and folds to appear. Dermal fillers can help restore that loss. The most common areas for treatment are the glabellar lines (between the eyebrows) and the under-eye area (also known as the "tear trough") to help improve the appearance of dark circles and hollows. It is also great for lip enhancement, and is FDA-approved for that purpose. Patients should expect 2-3 days of swelling and bruising may last 2 weeks. Overall results may last 6 months to up to 1 year. Generally, we recommend periodic touch-ups to help prolong the effects. Restylane Silk is the first and only FDA-approved treatment to specifically address lip definition and line control for silkier, smoother, natural-looking lips. As we age, lips change and the lines around them become more noticeable. Restylane Silk is unique in its silky smooth formulation of hyaluronic acid that allows for both subtle enhancement of the lips and treating the fine vertical lines around the lips. After treatment, swelling may be more likely in patients under 36 years of age and bruising may be more likely in patients over 35 years. In general, any swelling, redness, tenderness or bruising would typically be mild in severity and should last less than 7 days. Radiesse is a synthetic injectable filler that reduces wrinkles, creases and scars by stimulating your body’s own natural collagen production. Radiesse is an ideal product for both acne scars and volumizing deeper lines and folds in the lower face, cheeks, temples and hands. It should not be used in the lips or under the eyes. Results are visible immediately after the injection and will typically last longer than the hyaluronic acid filling agents. Treatments typically take 15 minutes and require topical or local anesthetic. Patients should expect 2-3 days of swelling and redness and bruising may last 2 weeks. Overall results may last 9 months to up to 1 year. Generally, we recommend periodic touch-ups to help prolong the effects. Sculptra is poly-L-lactic acid. It is a filler substance which replaces volume loss noted in aging skin. Sculptra is different than other fillers because it does not give instant results. Rather, it is used in a series of regular sessions to gradually volumize and resculpt facial contours over the course of several months. Results are incredibly natural in appearance and remarkably long-lasting. It's ideal for the patient who has significant volume loss in the face, but it can also be used effectively for more subtle, natural-looking correction in any patient. Topical anesthesia is required for treatment. Patients should expect 2-3 for days for swelling and redness and bruising may last 2 weeks. A series of 3-4 sessions spaced 6-8 weeks apart is usually needed but overall results last over 2 years.